Mystery solved!! When we came into our dining room yesterday morning we discovered the screen on our fireplace laying on the floor and the plastic bag full of insulation that was packed in the flue for the winter was laying in the fireplace. Well this afternoon I found a non-paying guest staying in Room 6 on the 3rd floor. It appears that he climbed on to our roof and up the chimney in pursuit of a grey squirrel nest and he must have lost his footing and made like Santa Claus. Ho! Ho! Ho! 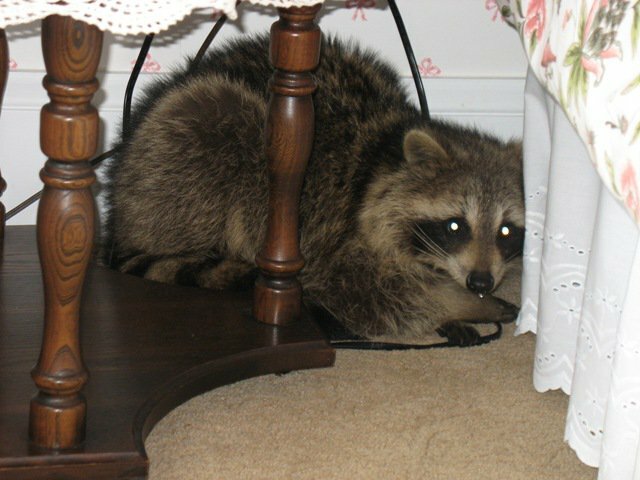 With a lot of help from a representative of Natural Resources he was escorted out of the Inn to be returned to Nova Scotia's woodland's.